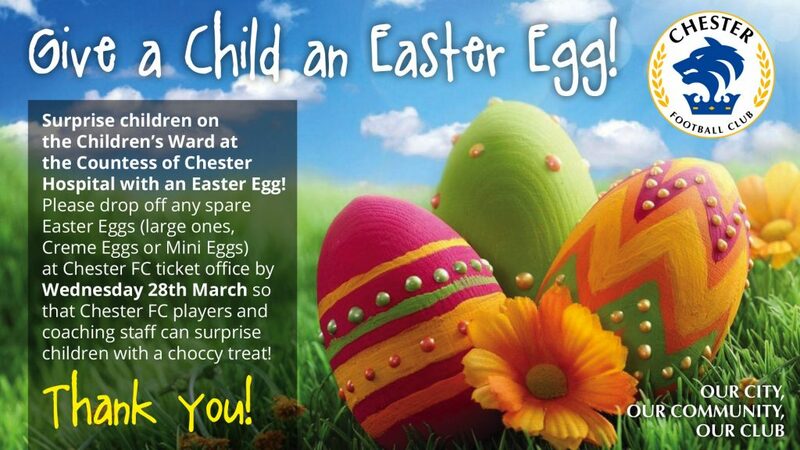 Chester FC is once again collecting chocolate eggs to be donated to deserving causes this Easter. The club’s annual Easter Egg appeal invites supporters to make donations of large or small eggs, which will be delivered to the children’s ward at the Countess of Chester Hospital and other local charities. Donations can be dropped off at the ticket office at the Swansway Chester Stadium, which is open on weekdays between 10am and 4pm, on or before Wednesday 28th March. Jim Green, chief executive of Chester FC Community Trust, said: “Every year our supporters ensure the Easter Egg appeal is a success and all donations will be gratefully received. For more information about the appeal, email community@chesterfc.com.